Description Heated Seats, Remote Engine Start, Dual Zone A/C, WiFi Hotspot, TRANSMISSION, CONTINUOUSLY VARIABLE (... Satellite Radio. FUEL EFFICIENT 36 MPG Hwy/29 MPG City! MOSAIC BLACK METALLIC exterior and JET BLACK interior, LT trim AND MORE! Heated Driver Seat, Back-Up Camera, Satellite Radio, Remote Engine Start, Dual Zone A/C, WiFi Hotspot, Heated Seats Onboard Communications System, Aluminum Wheels, Keyless Entry, Steering Wheel Controls, Child Safety Locks. LPO, ALL-WEATHER FLOOR LINERS, FRONT AND REAR, AUDIO SYSTEM, CHEVROLET INFOTAINMENT 3 SYSTEM, 8" DIAGONAL COLOR TOUCHSCREEN, AM/FM STEREO. Additional features for compatible phones include: Bluetooth audio streaming for 2 active devices, voice command pass-through to phone, Apple CarPlay and Android Auto capable. (STD), TRANSMISSION, CONTINUOUSLY VARIABLE (CVT) (STD), ENGINE, 1.5L TURBO DOHC 4-CYLINDER DI with Variable Valve Timing (VVT) (160 hp [119.3 kW] @ 5700 rpm, 184 lb-ft torque [248.4 N-m] @ 2500-3000 rpm) (STD). Chevrolet LT with MOSAIC BLACK METALLIC exterior and JET BLACK interior features a 4 Cylinder Engine with 160 HP at 5700 RPM*. 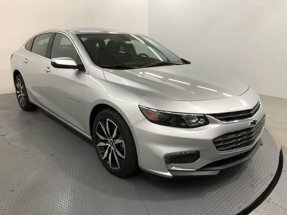 Edmunds.com's review says "Confident-feeling hybrid brakes are the best in the segment, lacking the uneven pedal feel common to competitors.". Great Gas Mileage: 36 MPG Hwy. LOCATED IN RUSHVILLE! Horsepower calculations based on trim engine configuration. Fuel economy calculations based on original manufacturer data for trim engine configuration. Please confirm the accuracy of the included equipment by calling us prior to purchase.